The Sunday 9:00am Mass at St. John’s is a wonderful way for families young and old to participate in prayer and worship together. This Mass supports the Religious Education program with seasonal and grade level liturgies throughout the school year, and is followed by Donuts and Coffee downstairs in Powers Hall. 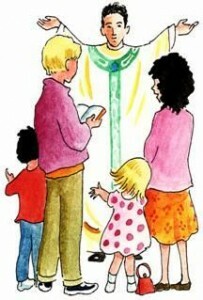 The Family Mass provides several opportunities for parents and children to actively celebrate Mass. Participating in special roles in the liturgy help children and adults alike to develop an understanding and appreciation for the Mass and Catholic traditions. If you think you or child/ren would enjoy helping during the Family Mass, there are lots of ways listed below. We’d love to have your help! Eucharistic and Liturgical Ministers – Ministering at the Family Mass is a great way to serve God and the community. Eucharistic Ministers assist in Communion distribution at Mass. Lectors proclaim the Word of God. There is a brief training session for both ministries. Parents interested in becoming a Eucharistic or Liturgical Minister can email Chrissy Cassa for more information. 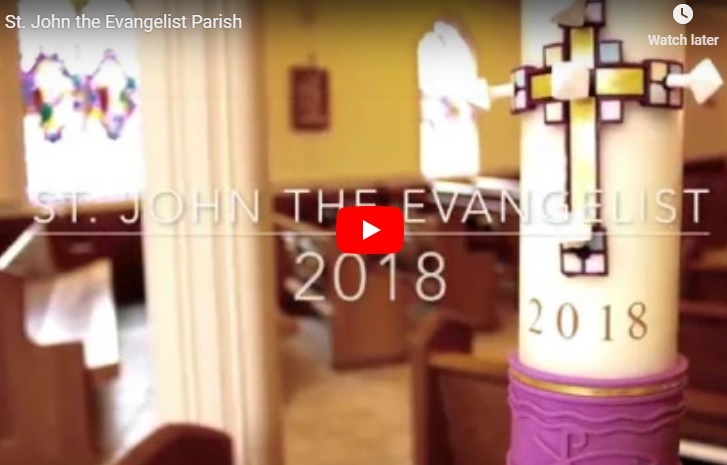 Greeters and Ushers – We always need help in welcoming people to the Family Mass, handing out bulletins or other materials, bringing the gifts to the altar, and overseeing the collection. These tasks provide a wonderful opportunity for families to minister together. We’d love to have you and your children help! Families interested in participating, please email Chrissy Cassa for more information. Altar Servers – Altar Servers offer service to God and the community by assisting the priest during Mass. The ministry is open to all youth of the parish who have made their First Communion. There are training sessions for Altar Servers – for more information please email Kelly Meraw. Family Mass Music – If you enjoy the upbeat, children-friendly, hand-clapping hymns we sing each week, we are always seeking new singers and instrumentalists to join our ranks. All ages are welcome! During the school year, we rehearse each Sunday morning at 8:00 a.m. to prepare for that day’s 9:00 a.m. Mass, and we also prepare special liturgies for Grade Level Masses, Advent, Christmas, Lent, Palm Sunday, Easter, and Pentecost. All are welcome to come sing and play with this group. Please come and join us! For more information please contact Maria Wardwell. Youth Choirs – Each year children (grades 1-8) are welcome to sign-up for the Christmas and Easter Youth Choirs. For more information please contact Maria Wardwell. Coffee and Donuts – Donuts and coffee are offered downstairs in the Social Hall after the Family Mass. It is a great place to meet and greet old and new friends. Families volunteer to help with set-up and clean-up each week – if you have not had a chance to host yet, or are ready to host again, please visit our Sign-Up page or email Chrissy Cassa.